Every one knows how to make black bean burritos but do you use canned black beans? 🙂 Black beans are so easy to cook and home cooked taste so good that once you try, you will never go back to canned version. Dry black beans are also very cheap. Just soak them in water for 5-6 hrs and pressure cook. Saute some colored peppers, mushroom, zucchini and add green chilli if you want it to be spicy. Add pineapple chunks too if you have it. Add salt. I also used whole wheat tortilla . 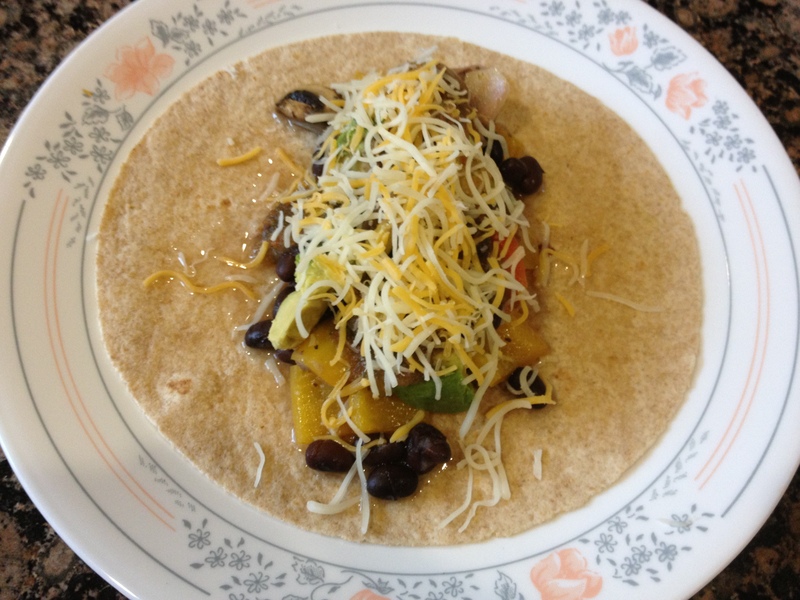 To assemble, add some black beans seasoned with salt, vegetables, few avocado chunks, chopped cilantro,salsa and cheese. Healthy, filling and fun meal ready. This entry was posted in Sandwich. Bookmark the permalink.